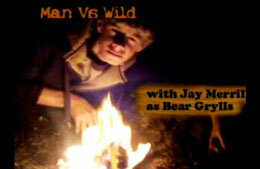 My son has come up with his second spoof on Bear Grylls. Enjoy! I watched it. It was a fantastic effort. My son (7) just did one too last month for a competition at church. We called it ‘Boy vs Wild’, and the senario was: he stalked and caught one of our chooks, and then lit a fire (real) and cooked it (pretend – we subsituted KFC). You should have him post it on YouTube!